Cruise ship and destination weddings have grown at a phenomenal rate the last few years. Years ago, there were practically none, but this year there will be thousands. One of the best things about a cruise wedding is that it comes with a built-in honeymoon, with no travel time wasted between the "I dos" and the fun. Most cruise weddings are on the major cruise lines. Wedding packages are available from the cruise lines listed below. Cruise weddings can take place onboard in a public room on the ship, or like other destination weddings on a romantic shore such as a beach or a glacier. Some ships have their own wedding chapels; others can beautifully decorate one of the onboard conference rooms. Many cruise weddings take place at the embarkation port. The guests come aboard, enjoy the service, and disembark before sailing. Other cruise wedding packages allow the guests to sail along with the bride and groom, thereby getting to enjoy the wedding and the honeymoon. Although all of the major cruise lines have their own wedding planners, the popularity of destination weddings has facilitated a growth in the number of independent wedding planners who offer both cruise or destination weddings. The price range of a shipboard wedding is just like one ashore--from a few hundred dollars to thousands. You will need to consult with a cruise travel agent, an independent wedding planner, or the cruise line's wedding department to select the best package for you. All wedding packages can also be purchased as a wedding vow renewal celebration. Although the options may seem to be endless, many packages are similar. Just be sure that your dreams and your budget are in sync. Carnival Cruises offers wedding packages for either an onboard or destination wedding. The onboard wedding can take place in several ports of call in the USA or the Caribbean, and the destination weddings include several islands in the Caribbean. Celebrity Cruises also has wedding packages while the ship is in port or ashore at a romantic destination. The cruise line also offers weddings at sea performed by the ship's captain. In addition to the wedding ceremony and reception packages, Celebrity also has some interesting special occasions' parties such as a welcome aboard reception, a bridesmaids' tea party, and a cigar and cognac party for the groomsmen. Holland America Line has weddings onboard at locations such as its private island Half Moon Cay or cities such as Ft. Lauderdale, Tampa, Key West, Halifax, New York, San Diego, Seattle, and Vancouver. Its ashore destination wedding locales include beach weddings in Hawaii, St. Lucia, St. Kitts, Grand Cayman, or Antigua, along with rainforest or glacier weddings from Juneau. Norwegian Cruise Line offers wedding packages onboard or at destinations in the Caribbean, Bermuda, Hawaii, or New York. Like the other cruise lines, the happy couple can have a private ceremony or invite their friends and family onboard. Norwegian also has several romantic packages that include a romantic dinner in a specialty restaurant, breakfast in bed, and other amenities, all of which would be good for those celebrating an anniversary. Princess Cruises has enjoyed a good reputation for its onboard weddings, and it was one of the first cruise lines to feature a wedding chapel on some of its ships. Princess contracts with a wedding planning service to assist the bride and groom-to-be with designing their wedding. Weddings can be held in the embarkation port, onboard, or at one of the cruise ship destinations. 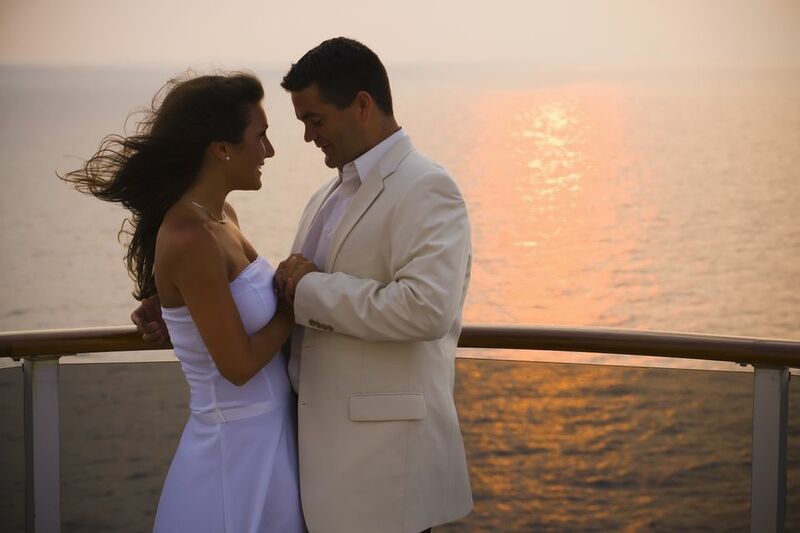 Royal Caribbean offers onboard weddings, as well as romantic ceremonies in a variety of destinations in the Caribbean, Mediterranean, and even Alaska. Is a Wedding Cruise is Right for You? What Does "Berth" Mean on a Cruise Ship?